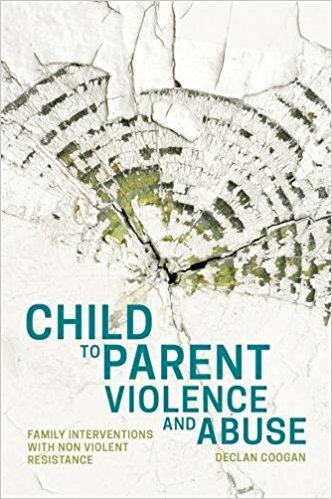 It’s great to see a new book in the field of child to parent violence and abuse coming out later this year from Declan Coogan, who has driven the development of understanding and use of Non Violent Resistance in Ireland. The book can be pre-ordered on Amazon now, or you can sign up to receive more information from the publisher, JKP, once it is available. Addressing the under-reported issue of child to parent violence and abuse, this book presents the effective intervention method of Non-Violent Resistance. Tips for adapting the method, alongside case studies and downloadable forms make this an invaluable tool for practitioners working with affected families. Providing an authoritative overview of the growing phenomena of child to parent violence – a feature in the daily life of increasing numbers of families – this book outlines what we know about it, what is effective in addressing it, and outlines a proven model for intervention. Based on Non Violent Resistance (NVR), the model is founded on a number of key elements: parental commitment to non-violence, de-escalation skills, increased parental presence, engaging the support network and acts of reconciliation. The book outlines the theory and principles, and provides pragmatic guidance for implementing these elements, accompanied by case studies to bring the theory to life. Declan was part of the team who worked on the pan-European RCPV project which reported in 2015; and continues to teach, train and develop the work within Ireland.